Make it Pop is a K-Pop inspired, Canadian-American, musical comedy series that stars Caleb Davis (Dale Whibley), Jodi Mappa (Louriza Tronco), Corki Chang (Erika Tham) and Sun Hi Song (Megan Lee). All together they are known as XO-IQ. Not only can this talented bunch act, they can also sing – and sing very well, which they proved at this year’s YTV Summer Beach Bash. They had the crowd going crazy over their infectious pop tunes, great dance moves and cute outfits. The show follows each characters’ adventures and takes us through their journey as a music group, with a whole lot of Nickelodeon’s signature comedy that viewers love. Each character has their own back story and individual personality, so there’s no doubt this that show is bound to be super interesting and highly addictive. Faze sat down with the members of XO-IQ after their performance at the YTV Summer Beach Bash to talk the group about Make it Pop, their characters and their careers. What originally sparked your interest in acting? Dale: I was very young when I started. I started when I was about four years old. I was a crazy kid, I loved to introduce myself to people and I loved meeting new people. My parents thought I needed to do something to channel all of that energy so I started doing some acting. I started with some commercials and now I’m here with these girls on Make It Pop. Erika: I’ve always loved acting and I did a lot of musicals at school, performing arts camps and things like that. But because I lived in Asia, there wasn’t a lot of opportunities since I didn’t speak the languages of the countries that I lived in. Last year I decided I wanted to really pursue acting professionally and Make it Pop was one of my first auditions so I really lucked out. Megan: I’ve always had a passion for performing ever since I was really little. I begged my mom to find me an agent and she wasn’t as supportive at first but in the end, I think after participating in a school talent show when I was in the fifth grade, I finally convinced her and started going off to auditions and commercials and now I’m here. Louriza: I lucked out with being a mouse in the “Nutcracker” when I was seven. I didn’t have any dance training and my mom saw this newspaper ad and put me in a long sleeve sweatshirt and sweat pants and all these girls had buns in their hair and full body suits and tutus and somehow got the role. From there I was like maybe I should try singing and acting so it kind of went from there. What does your name, XO-IQ mean? Louriza: XO-IQ means hearts and minds. Tell us a little bit about Make it Pop and your characters. Erika: Our show surrounds four students and they’re all completely different. They come together through their love for music and try to form a band called XO-IQ. It’s set at a boarding school and we just follow the characters’ adventures. There are some love stories, breakups, makeups, fights and lots of stuff like that. It’s also a musical comedy so of course there’s some humour and music in it as well. Dale: I play Caleb Davis. He’s pretty crazy, I wouldn’t say the only crazy one because there’s Sun Hi, but he’s the one that gets into the most trouble. He goes off on his own and blows stuff up. He’s the DJ of the group XO-IQ. He listened to the girls’ voices and saw who they were and what they could be as a whole. Erika: I play Corki Chang. Corki is super girly and very sophisticated. She’s a billionaire heiress and she’s definitely the brains of the group. She’s super book smart but she hasn’t really experienced a lot of the typical teenage girl things like boys, having crushes and having to room with two other girls her age. She’s very naive so that brings a lot of comedy to the show. Megan: I play Sun Hi Song. Sun Hi is the lead singer of the group. She’s very hyper active and she’s a social media guru so she’s on her cell phone all the time. She has a fan base called the Sun Hi nation and she’s totally crazy, energetic, and positive and has so much passion and love for music. Louriza: I play Jodi Mappa. She is a fierce, spicy little one. She is the choreographer and stylist of the group so she’s very much geared towards fashion for the group and fashion for herself. She’s very confident and independent and she’s the dry, sarcastic humour within the show. Would you say that you and your characters have share some similarities? Erika: For sure, I think our characters are all heightened versions of ourselves. We definitely see a lot of our characters in each other. We’ll be at dinner and we’d start saying things that out characters would say. Megan: Just like my character is huge on social media, I myself have been on YouTube since I was 13-14 years old, so I am very familiar with all of the social media outlets. Also, Sun Hi is very much a diva but in some ways I feel very similar to her. But if she was real, I would teach her how to be more humble and more toned down, but she’s so much fun to play. What was it like making an appearance at the pre-party for the 2015 Nickelodeon Kids’ Choice Awards in Los Angeles and being introduced by Nick Cannon himself? Megan: It was a dream come true. It was definitely a blessing and a true honor to be part of this group and to be supported by the amazing Nick Cannon. 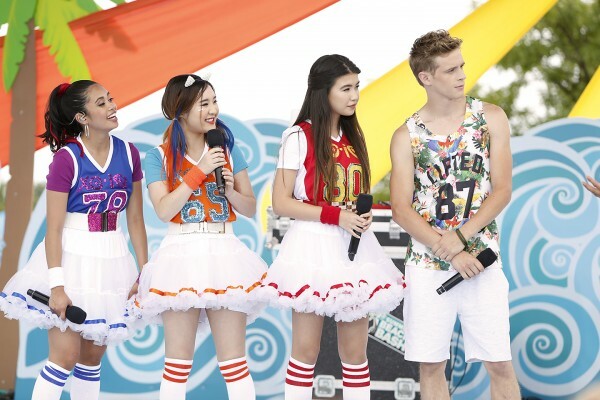 How excited were you guys to be performing at the YTV Summer Beach Bash in wonderland? Megan: It was such a blur to us! We were talking about how we don’t remember what we did on stage because we were all just so excited and stoked with the audience, and everything that was going on. It’s like our first live performance that was televised so it’s a very huge moment for us. Louriza: We do a little huddle and we have a chant called “Team 110” which means we go 110% all the time on stage. We did a couple jumping jacks backstage and people were looking at us weird. And just kind of vibe off each other. I love XO-IQ!And their songs are just awesome.I liked/love them almost 2 years ago.I have their walls filled with their images. OK!I admit i really love XO-IQ. But i also like Lourizas,Erika and Dale.